Discussion in 'Antennas, Feedlines, Towers & Rotors' started by W0BTU, Jan 10, 2011. I would appreciate some input by all the antenna experts here on an article I just uploaded to one of my web sites. This is just a rough draft. Some wording needs to be changed, paragraphs need to be moved to a more logical order, and of course some graphics would help, but the thrust of my vertical stacking argument is there. Please let me know what you think, good or bad. I would like to publish this in a ham magazine, but whether that happens or not is another story. I think patterns might help your article. As each element or cell in the array becomes more directional, available stacking gain is generally reduced. This is because to have gain we must stop radiation in an area that has significant energy. I actually prefer to stack both vertically and horizontally but the mechanics are difficult. I did some free space model studies to better understand Cebik's claim that substantially greater than 3dB gain was available from stacking to identical long Yagis. The study indicated to me that Cebik had one (as he was wont to do often) a single parameter optimisation. 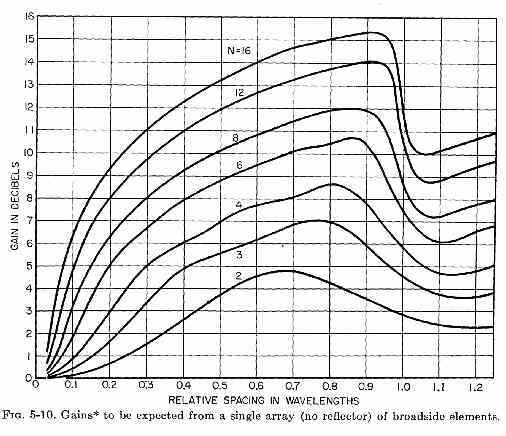 Sure,you can get higher gain in that case, but a very narrow beam pattern is created with forced first nulls much closer to boresight, and much larger second lobes than would be the case for ~ 3dB stacking. The array has relatively low gain for its volume, and very sharp pointing for its gain, so is to my mind, less practical. For some applications, the off boresight performance is very important. For example, for EME, the total noise power collected by the side lobes is very important, and creating a higher magnitude second side lobe that captures noise from hot earth is undesirable. My article Estimating Beamwidth of DL6WU long boom Yagis for the purpose of calculating an optimum stacking distance might stimulate thinking, but again it is for free space models. I had some interesting discussions with Guenter Hoch (DL6WU) and Ian White (GM3SEK) whilst researching the article. I did write to Cebik, but did not receive a meaningful response, I could buy his then recently published CD of some 600 odd models (IIRC) of long Yagis for further information. The free space performance of these antennas is a bit academic, but including real ground opens up a wide range of height / ground type issues without acknowledging the effects of the built environment. ...I think patterns might help your article. I need to clarify in my article that it is not about optimizing the stacking distance for maximum array gain. I went through all this looking at a 20 meter antenna stack. I could only get about 2 dB or so gain per double number of beams by stacking, and had to pick and choose heights carefully. The best way to use four antennas by far was to stack two and have two broadside (collinear). The classic H layout. I really never could find may cases where a vertical stack of more than two antennas was worth much. I was using four element long boom antennas (34 foot boom on 20 meters) made from 5 element Hygain 205 long johns. With larger antennas in the model the problem got worse. This is what old fashioned theory says also. I limited tower height to 250 feet on 20 meters. I tend to think this is true in real life because I often tie or beat another local who have multiple large Yagi's in a tall stack. Tom, if you look at what K1WHS has done on two meters it might change your mind. He has 16 stacked yagis (all vertically stacked, but horizontal yagis) fix-aimed and side mounted on his 120' tower, and all for 144 MHz. It works very well. I have no idea how well this would scale to 20 meters, but it seems it might take a 1200' tower. Dave had good justification for doing what he did (using short boom, wide beamwidth yagis, and a whole bunch of them) since he lives in the NE corner of the U.S. and 75% of everybody he'd want to work in a VHF contest would be in about a 90 degree quadrant, from W to S. From his QTH, that would cover a great deal of the country, especially within VHF range. He wins VHF contests from up there, which isn't so easy because he's way NE of Boston. So, it probably does exactly the job he wanted it to do. Most of us don't need to do that, although where I am it would help because 75% of everybody I need to work is between NW and E (on 2m). If I had a 120' tower I might try it, or something similar. 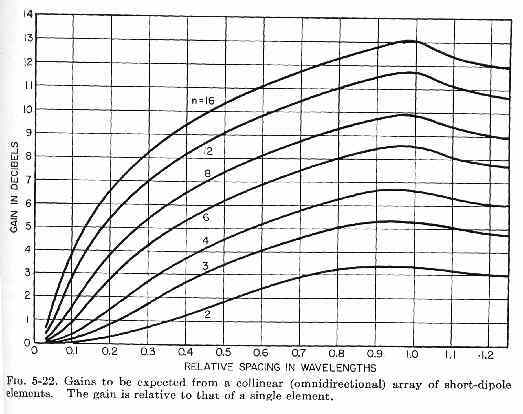 I saw something about unequal wavelength stacking of yagis (ie maybe 35', 50', 70', & 90') within the last few months. (I don't remember where, maybe here) The advantage claimed, which I agree is needed, was that instead of having the usual low angle highest gain lobes interspersed with very low gain nulls (like separated fingers) it tended to partially fill in the nulls by making the lobes fatter. I can easily see how two hams near each other ( both with good ground properties ) having identical power & single antennas, except one is 85' high and the other is say 105' high (on 20 meters) could have dramatically different signal reports from the same DX station over 5000 miles away because of the difference in stacking heights. I think we are talking apples and oranges here. Although I did mention early on in the article that I had a stack of two 10 meter monoband yagis, the article is talking about terrestrial VHF. The reference to HF there is misleading, I now see. I don't understand which takeoff angles are optimum on 20 meters. But I've always thought that as a general rule, lower is what you want for distant DX and higher is better for stateside work. There is no ionosphere at VHF+ like there is on HF. For terrestrial work at VHF and above, lowest is almost always best. I updated the article a little (mostly at the top) to help clear this up. I was punching some printouts to put in 3-ring binders early this morning, and there happened to be this very page, but from 7/21/2008. The more I studied it, the more fascinated I became with it. I learned a number of things from it. But the main thing that jumped out at me was that stacking two dipoles in a broadside array (one over the other) actually had 4.8 dBd gain instead of just 3 dBd. I was not claiming in my article that two stacked quagis had any more than 3 dB gain over a single Quagi, only that the apparent gain was greater than 3dB due to the lowered radiation angle. Whether the gain increase from stacking two Quagis is also 4.8 dB, I don't know. I have to get to work, and I'm still too lazy to model it. ... Cebik's claim that substantially greater than 3dB gain was available from stacking to identical long Yagis. I would LOVE to see Cebik's claim in detail; However, cebik.com now costs money to access, and I'm not paying big bucks for his CD-ROM. Does anyone have a saved copy of Cebik's article that I can look at?